Since November 2016, I have been counting down the days till I return to Portland, and experience education like I’ve never encountered before. Since qualifying as a makeup artist, I’ve taken masterclasses and courses to improve my skills, but I felt I needed more than what I was receiving. 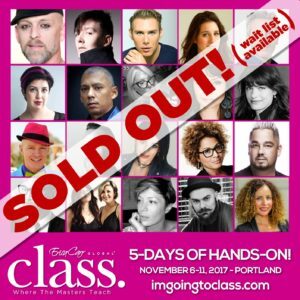 I decided last year to travel to Portland, Oregon USA for almost a week long of pure learning from some of the worlds biggest makeup artists. During that week we watched, listened and spoke to these leading artists about everything makeup, industry and business related. Every evening we practiced what we learned over the course of the day, and had our educators critique our work. I was overwhelmed by so much information and talent surrounding me. Some of the students portfolios were mind-blowing, and everyone shared information openly and treated each other as equals. Egos were non existent and I felt like I belonged. So, when the opportunity arose to attend 2017 Class, I bought my tickets, booked my accommodation and vowed I’d be there no matter what it took. I still didn’t know who would be teaching this year, but judging by 2016 I knew the creater of the event, Erica Carr would up her game and deliver world class artists. As the educators were announced, I was so ecstatic! Some of of my favourite educators from 2016 were returning, including Beau Nelson, Stephen Dimmick and Pati Dubroff! These were my amongst my favourite classes last year as they do amazing SKIN…my favourite thing ever when applying makeup. This year some of the new educators include Kristofer Buckle, who counts Blake Lively and Mariah Carey as two of his main clients, Kabuki, who works and has worked with EVERYONE who’s anyone in the music/acting/fashion and beauty world and the one and only Val Garland, Global Makeup Director for L’oreal Paris and Vogue Contributing beauty editor!! Altogether there are over 20 educators teaching a variety of classes over the course of 6 days. This year I will be prepared with my questions and soak every ounce of information I receive from these masters as well as my talented fellow students from around the world. I hope to chat with the artists and answer any questions you may have. Send me your questions as I will be recording my journey to share with you all. I am so excited to be able to follow my dreams and to bring home new knowledge and techniques to all my clients. I am also excited to stock up on all my favourite products from US. I will be spending 5 days in Los Angeles prior to Portland, networking, visiting makeup stores, exploring and having the best time ever and of course preparing for a week of intense education.